We catch up with Major Bludd's past and present in Cobra #17. Meanwhile, Mike Costa lays the foundation for the introduction of some fan-favorite characters into the IDW universe. 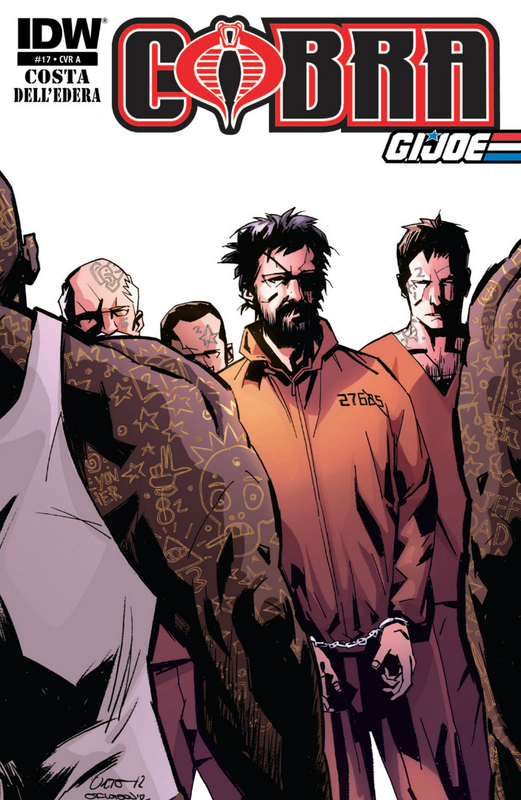 Costa is arguably the best ongoing Joe writer in IDW's employ. Few others could write an issue that contains mostly flashbacks and exposition and still have that issue be the highlight of the month. Costa pulled it off with Chuckle's farewell letter issue, and he pulls it off again with this issue. It's Costa's emphasis on the characters and their development that carries this series. Protagonists become flawed and relatable. Antagonists become nuanced and sympathetic. Plotlines don't need to wrap up in 6 issues, and as a result, the over-arching story flows more organically. While the majority of this issue is Flint talking to Bludd and Bludd reminiscing over his past, it still is the most interesting Joe comic put out by IDW this month. We see some of Bludd's origins this issue; more importantly, we see his motivations that's guided him through life: his wanderlust, his entrepreneurial spirit, and perhaps most importantly his love of family. Bludd's family was introduced in Brooks' Hearts & Minds miniseries; that revelation was startling mostly because traditionally Bludd has been one of the most underdeveloped, one-dimensional members of Cobra's upper management in nearly all media. In the Marvel run, where both Firefly and Zartan get convoluted and unnecessarily ninja-fied origins, and where Destro and Baroness get almost as much "screen time" as the Commander, Bludd's only memorable trait is his bad poetry. Costa has done more this issue to flesh this underutilized character than anyone before him. ARTWerther Dell'Edera flies solo with this issue, handling both the penciling and the inks. But he still gives the book the Fuso-inspired noir style. I'm usually a fan of Dell'Edera's work, but this issue left me a little disappointed. Some of the panels came off overly-exaggerated to the point of appearing cartoony. And while I have grown to love the heavy inking usually found in the Cobra series, it seems that in this issue, heavy inking was used more to hide and blur details, not to enhance atmosphere. I've seen Dell'Edera do some amazing work; unfortunately, this issue was not one of them. INTANGIBLESAs a self-professed jaded comic reader, it's not often that I read the last page and automatically get anxious for the next issue. I am very anxious for the next issue. VERDICTAn interesting origin story of an interesting character, while setting up the stage for some potentially awesome things to come. Highly Recommended.